Hello, everyone. What are your thoughts on this answer? Where can I find model answers for bar charts that have various ages as categories. Thanks for your help in advance! The following bar chart illustrates how many males and females belonging to the 6 age groups exercised daily in Australia in 2010. Overall, most men engaged in athletic activities during teenage years, whereas women reached the highest level between 45 and 54 in 2010. Besides this, more women trained during their adult years (between 26 and 64) in comparison to their counterparts, albeit both males and females plateaued at the nearly identical percentage in the most mature age group. To begin with, even though males surpassed females by 5.1% in terms of daily involvement in fitness activities among teenagers, women reached higher levels in other age groups. Furthermore, males whose age ranged from 35 to 44 stood at the lowest percentage of 39.5%. Nevertheless, there were less significant discrepancies among 55 and 64 year-olds of nearly 8% and just above 10% in people whose age was 45 and 54. In contrast, females reached the most serious level over 53% in the group representing people aged from 45 to 54. Even though females whose age ranged between 35 and 64 exceeded 52% in terms of engagement in sports training, the differences between teenagers and the most mature people were below 1%. "how many males and females"
Regular physical activity doesn't necessarily mean daily. "Exercised regularly" is more accurate. Overall, most men engaged in athletic activities during teenage years, whereas women reached the highest level between 45 and 54 in 2010. Besides this, more women trained during their adult years (between 26 and 64) in comparison to their counterparts, albeit both males and females plateaued at the nearly identical percentage in the most mature age group. I think the detail about how (a greater percentage) of women than men trained is the most significant feature of this chart, so I'd put it first and leave out the other details. Please review my writing based on the question I have uploaded as image. 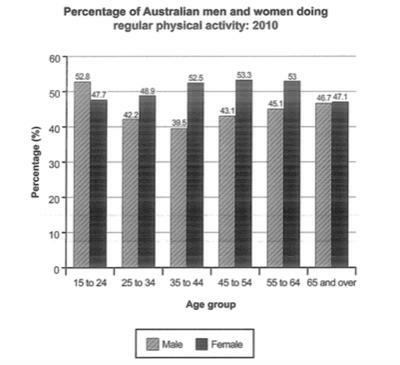 The shared data compares the percentage of Australian men and women doing regular physical activity, across various age groups. As per the graph, majority of men are most active during the age 15-28 whereas for women, majority of them could be seen being most active after 35 years of their age till 64. Since the graph talks about the regular physical activities carried out by men and women in their lifetime, a lot of people may assume that this talks about the workout and exercise that people practice. However, physical activities does not only mean exercise. Men during their early stages of life spend a lot of their leisure time playing outdoor sports like cricket and football etc and go hiking. Whereas for women, their initial days are spent doing pajama parties and going out occasionally for trips. Also, more women are into indoor games than outdoor games which is why their overall lifestyle suggest less physical activities. However, if we look at the graph, more women are active after they hit 35. Maybe because a lot of women get married and settle down by that age which by default increases their physical activities in terms of doing the house chores while taking care of their physical well being. Another way of looking at it could be that by the time men hit 30, they get into jobs and spend most of the time infront of a computer screen which drastically reduces their physical activities and hence when compared, they are less active then women. At 255 words, this would take far too long to write under real test conditions. Consider re-writing in 20 minutes and cut it down. You can start by editing out the sexist assumptions and opinions. Task 1 should not include any speculations about the reasons for the data, opinions or anything that isn't on the graph. Save your rather un-academic comments about pajama parties for Task 2.